Weather isn't looking too pleasant for tonight and sunday, so I had a little fit and drove to Edale instead! 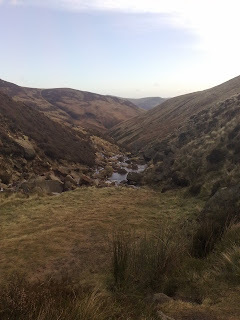 I'm on my way up kinder via Grindsbrook and its lovely if not a little windy. Just stopped for a slice of pizza - real hill food! On the look out for a quite pitch to wild camp sometime in the near future. More later.